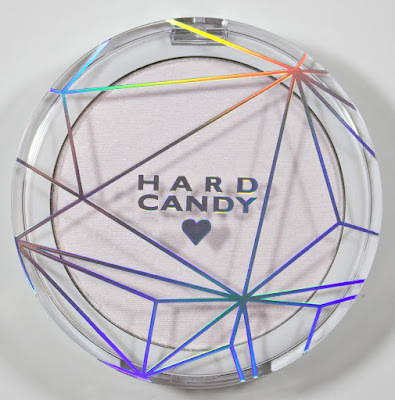 Hard Candy Sheer Envy Prismatic Highlighter Iridescent Pearl Powder. 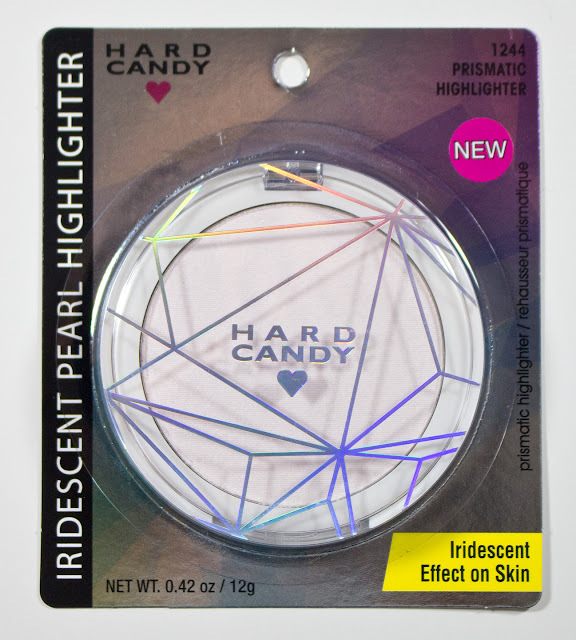 The Hard Candy Sheer Envy Prismatic Highlighter Iridescent Pearl Powder retails for $7.98CAN for 0.42 oz/ 12g of product. 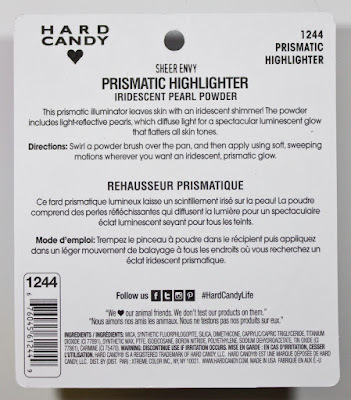 Hard Candy Sheer Envy Prismatic Highlighter Iridescent Pearl Powder ingredients. Hard Candy Sheer Envy Prismatic Highlighter Iridescent Pearl Powder compact lid. Hard Candy Sheer Envy Prismatic Highlighter Iridescent Pearl Powder back of compact. 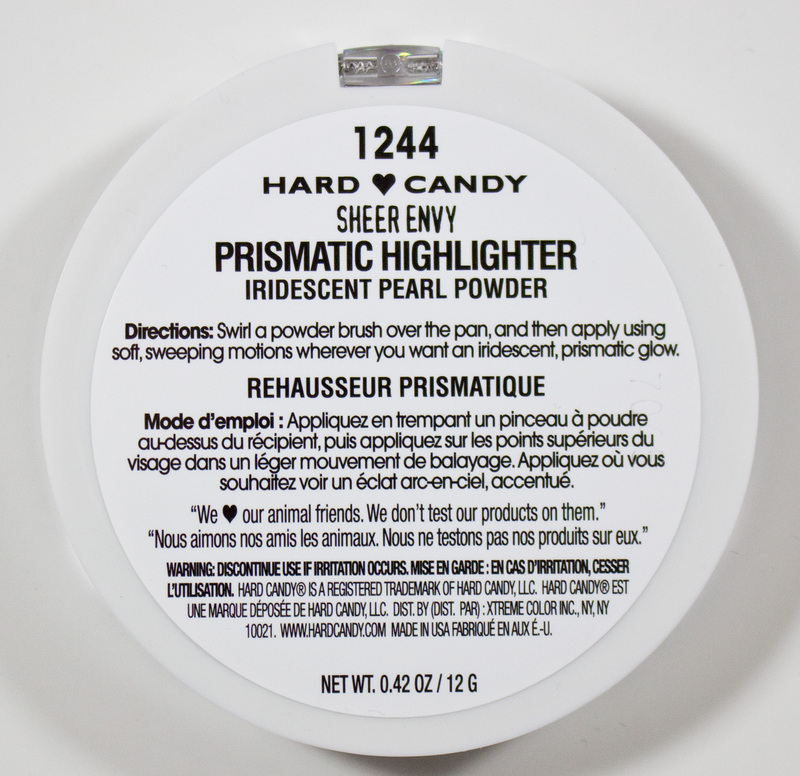 This Hard Candy Sheer Envy Prismatic Highlighter Iridescent Pearl Powder is a pale pink/white satin/pearl with ranbow glitter/shimmer. I found that the only way I could wear this powder if buffed one the skin with a brush. 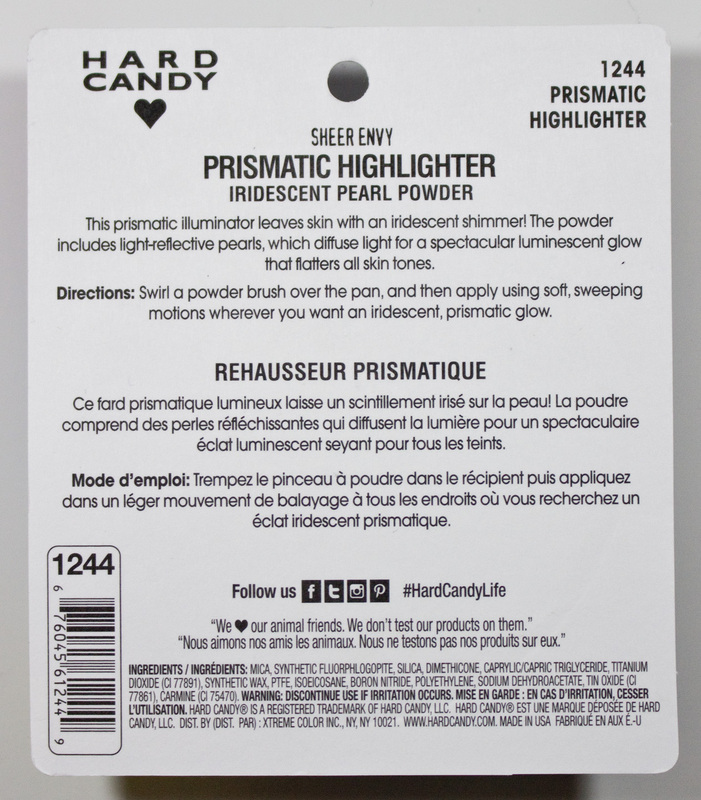 This causes all that rainbow shimmer to fall off my skin leaving with just the pearl based powder on the skin. It reads very subtly on my skin tone and works best over foundation than on bare skin, I think the synthetic wax they used is part of the reason as to why that is and applied chalky on bare skin. 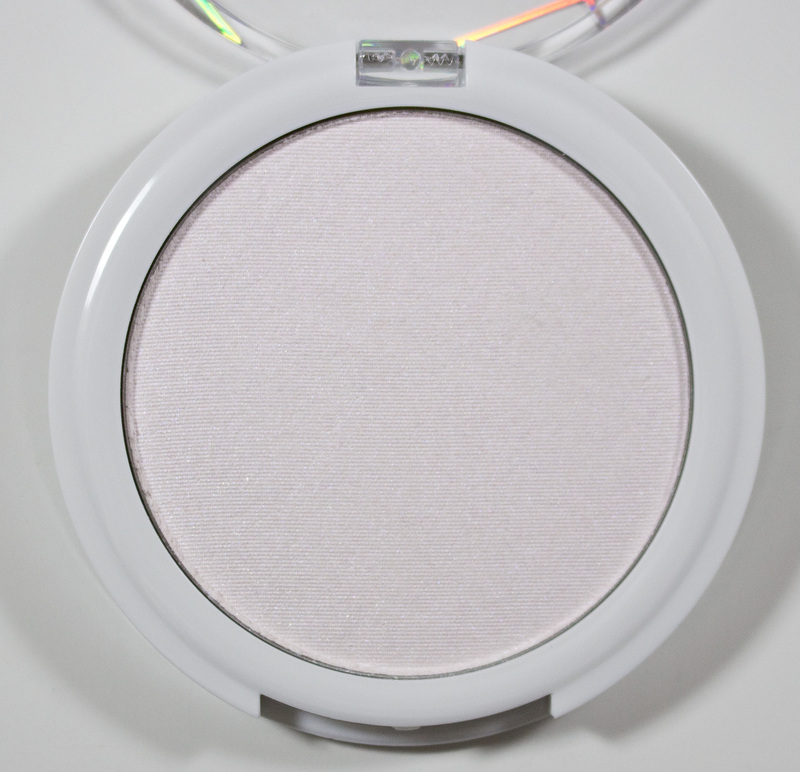 Wear: On the cheeks, it lasts 4-5 hours before noticing any fading of shimmer. Daylight swatches: Hard Candy Sheer Envy Prismatic Highlighter Iridescent Pearl Powder, applied heavy, buffed out in the middle, and buffed out over foundation on the wrist. 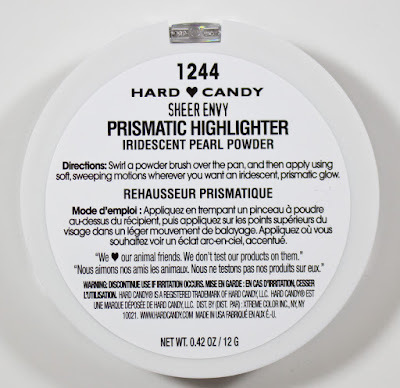 Flash swatches: Hard Candy Sheer Envy Prismatic Highlighter Iridescent Pearl Powder, applied heavy, buffed out in the middle, and buffed out over foundation on the wrist. 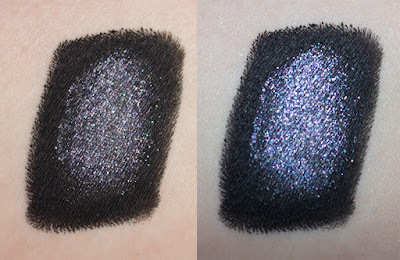 Daylight and Flash swatches: Hard Candy Sheer Envy Prismatic Highlighter Iridescent Pearl Powder, applied over a black base. Sigh, I was really hoping this was going to be a good one considering the brand makes wonder baked powders. This one just barely there for me and I feel like this is too white to work on other skin tones with the lack of base aura colour that looked pink in the pan but not on the skin. On my pale skin, I was mostly just seeing the rainbow shimmer. When it does work over foundation it very non-refined highlighter and more of a shimmer exceptions... Which is fun but I like my highlighters to read more "natural" and less noticeable shimmer/glitter for me. 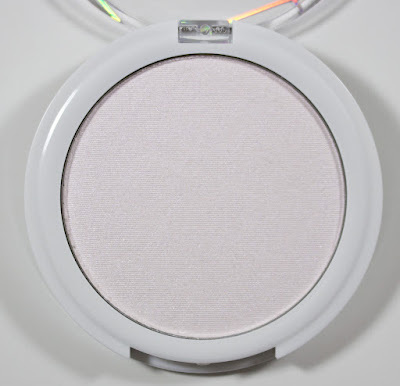 I was hoping this would be a Becca Shimmering Skin Perfector Pressed Prismatic Amethyst or Kat Von D Alchemist Pink Opal dupe but those powders are much more refine highlighter texture compared to this one.